Apprising Ministries has told you that the Elephant Room 2, with its mainstreaming of Word Faith mogul and prosperity preacher T.D. Jakes really detonated as an explosion within mainstream contemporary evangelicalism and its aftermath continues spreading shockwaves throughout professing Christendom. So far we’ve witnessed cracks forming in The Gospel Coalition, Acts 29 Network, and the Harvest Bible Fellowship, which was founded by Elephant Room curator James MacDonald.1 Sources inside Harvest Bible Chapel, where MacDonald is senior pastor, tell me there’s unrest within HBC itself as well. There are those who are quite disappointed with the drift of James MacDonald, e.g. with the rise of Emerging Ecumenical Evangelephants And The Word Faith Movement and Steven Furtick, James MacDonald, And Joel Osteen. MacDonald and ER 2 co-host Mark Driscoll also seem to be forming an ecumenical magisterium. With all of this fresh in mind then, I’ll now point you to more indication that there are people close to Harvest who have very serious concerns about James MacDonald. 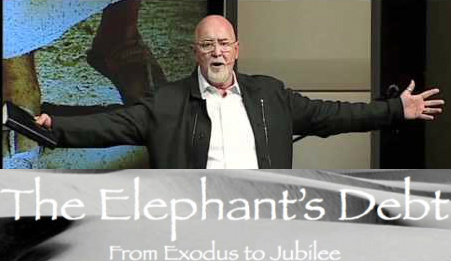 Over the past few days a number of sources have sent me the link to something called The Elephant’s Debt: From Exodus To Jubilee of Scott Bryant and Ryan Mahoney. As I understand it, Bryant was actively involved in a couple of church plants for Harvest Bible Fellowship and Ryan Mahoney, whom I’m told is an attorney, has also been personally involved with HBC. In addition, sources have informed me that Bryant and Mahoney have spoken with several former members of leadership. Over the past few months, on more than one occasion, the authors of this blog have been asked to explain why we write on the subject of Harvest Bible Chapel. This is a legitimate question worthy of an open and honest answer. Why involve others who may be outside the walls of Harvest?…this question also presumes that Harvest Bible Chapel is nothing more than a local church impacting its own local congregation. In the case of Harvest, this is simply an untrue assumption. As anyone can clearly see, the actions of James MacDonald extend far beyond the limited reaches of his own congregation. In 2011, MacDonald’s church was listed as one of the 25 largest churches in the United States, while also being listed as one of the fastest growing. There’s also another legitimate reason why any necessary correction in this case would need to be public. It’s because of the inherent flaw in the cult of celebrity megachurch vision-casting prophet-leaders; they believe they’ve received direct revelation from God, i.e. to disagree with them is essentially to oppose God Himself. If you disagree with or are disloyal to the vision that God supposedly gave Mark Driscoll then you’re going to be thrown of the bus or have the bus run you over. In Driscolls own words, by God’s grace there will be a mountain of bodies before they’re done. I secretly wish that these two verses were my elders’ favorite verses. They’re not my life’s verse, but I wish that my elders had these two verses for their favorites. One’s from the pastoral epistles where it says: Reject a factious man after the second admonition (Titus 3:10). I wish that was my elders’ life verse. How much heartache is caused in a church by elders who forebear, for the sake of friendship, with a factious man? I wish that my elders’ life verse was: Reject a factious man after the second admonition. And I wish their other life verse from Proverbs was: Cast out the scoffer and the strife will cease (Proverbs 22:10).